US President Donald Trump and his French counterpart Emmanuel Macron sought Saturday to ease tensions caused by a defence row that risked clouding World War I centenary commemorations in Paris. Trump was one of dozens of world leaders taking part in events to mark the 100th anniversary of the end of the war. On Saturday, he and his wife Melania cancelled a trip to Belleau Wood battlefield and cemetery in northern France, citing “scheduling and logistical difficulties” caused by the rainy weather. Coming on the eve of Veteran’s Day in the United States, the decision drew criticism on social media, where many noted that the rain had not stopped Macron, Germany’s Angela Merkel or Canada’s Justin Trudeau from paying their respects to the dead. “They died with their face to the foe and that pathetic inadequate @realDonaldTrump couldn’t even defy the weather to pay his respects to The Fallen,” Nicholas Soames, a British Conservative member of parliament and grandson of Winston Churchill tweeted. Ceremonies have been held across the world this week in honour of the 18 million soldiers and civilians who perished in World War I. In one of the high points, Macron and Chancellor Merkel on Saturday unveiled a plaque to the Franco-German reconciliation in the forest clearing in northeast France where the armistice ending the conflict was signed. Macron, a centrist advocate of open borders and multilateralism, has repeatedly invoked the war in recent weeks to hammer home his message that rising nationalism is again destabilising the world. He will host Trump, Merkel, Turkish President Recep Tayyip Erdogan and Canadian Prime Minister Trudeau, among others, for dinner at Orsay Museum on Sunday evening. On Sunday morning, they will be joined by President Vladimir Putin of Russia for the main ceremony at the tomb of the Unknown Soldier in Paris, which will draw in 70 world leaders. On Saturday, Macron and Trump downplayed their divisions after a tumultuous start to the weekend, which saw Trump fire off a tweet slamming Macron’s proposals for a European army just as his plane was touching down in Paris. 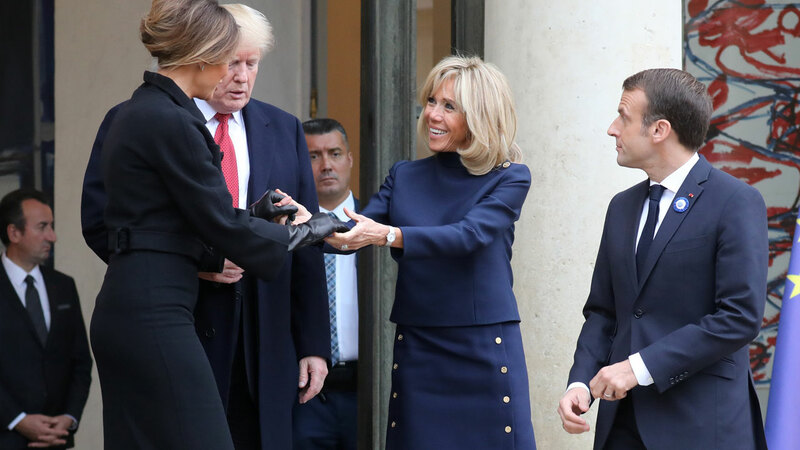 The spat was the latest between Trump and Macron, who struck up a warm relationship initially but have clashed over a growing list of issues, including Trump’s decision to pull the US out of the 2015 Paris climate accord and the Iran nuclear deal. “President Macron of France has just suggested that Europe build its own military in order to protect itself from the US, China and Russia,” the US president tweeted, referring to remarks made by Macron in an interview three days earlier. “Very insulting, but perhaps Europe should first pay its fair share of NATO, which the US subsidizes greatly!” he added. In the interview, Macron had cited Trump’s plans to pull the US out of a Cold War-era nuclear treaty and said a joint European Union force was needed to end Europe’s reliance on US military might. “We have to protect ourselves with respect to China, Russia and even the United States,” he said, listing various threats including cyberattacks. During talks later at the Elysee Palace Macron said his call for greater European autonomy on defence was not intended as a snub towards the US and backed Trump’s calls for EU members to boost their defence spending. “We need a much better burden-sharing within NATO,” he said, patting his counterpart’s knee affectionately. Trump described himself and Macron as “very good friends” and expressed support for “a strong Europe”. The US leader has however ducked out of a peace conference Sunday in Paris, which Macron and Merkel intend to use as a platform for promoting multilateralism. The WWI commemorations come at a watershed moment for the liberal post-war order, with anti-immigration populists at the helm in the US and Brazil, sharing power in Italy, and making strong gains in Germany, where Merkel has announced her resignation in 2021 after a series of electoral setbacks. On Saturday, she visited the site of Germany’s capitulation at the end of the World War I, the first German leader to do in 78 years. The forest in Compiegne is doubly symbolic as Adolf Hitler chose the same train carriage in the same clearing to sign the surrender of the French on June 22, 1940 at the start of World War II. Macron, sporting a cornflower in his lapel — the French equivalent to Britain’s remembrance poppy — and Merkel reviewed grey-clad soldiers from the Franco-German brigade, before unveiling a plaque to Franco-German reconciliation. They also visited a replica of the carriage which was destroyed during World War II.